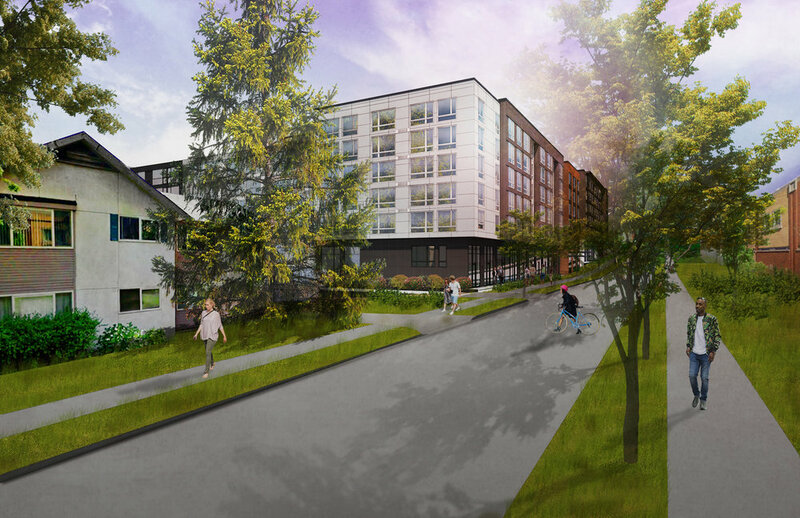 Our team is happy to report that First Central Station, a 385 unit mixed-use development in Seattle’s central district, has received unanimous approval from the East Design Review Board. b9 architects, Build LLC, Karen Kiest Landscape Architects, and local artist Paul Rucker presented the design. The meeting was the second and final stage in the city’s design review process and highlighted the team’s efforts to work with neighbors, community organizations, city officials, and the design review board to provide a unique project that is sensitive to a variety of concerns. The collaborative efforts of the architectural design team, b9 architects and Build LLC, have resulted in a project that captures the distinct design philosophies of each office and projected them on to different portions of the site, a strategy that produces a sense that the buildings have emerged from multiple voices as opposed to a single master plan. The team utilized a variety of communication tools to bring the design review board up to speed on the project – renderings, diagrams, and a presentation model assisted in making plain the complexities of the design. In the end, the support of the board was a reminder that successful design can emerge from complex collaboration and neighborhood inclusion. It can be hard work, but the result, we believe, will be one of a kind. "On June 10, 1918, Seattle saw its first local jazz band perform in Washington Hall, at 14th Avenue and Fir Street. In the 1920s and 1930s jazz flourished in the Central District. We have an opportunity with the construction of First Central Station to acknowledge this legacy by integrating musical notation and themes in the wayfinding. The example shown here uses quarter notes as directional signs to bordering neighborhoods. Solfège is a system for singing notes. If you’re familiar with the famous Rogers and Hammerstein song “Do-Re-Mi” from The Sound of Music, you already know the solfège note names: do, re, mi, fa, sol, la and ti."